The CTV ImmunoStrip® is an on-site tool to quickly screen citrus crops for Citrus tristeza virus (CTV). 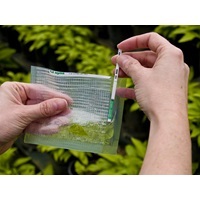 The CTV ImmunoStrip® is intended for use with leaves, young shoots and petioles. It is NOT recommended for woody tissue. Ideal for scouting regimes or to test plants before purchasing or accepting a shipment of plants. The test is proven to detect over 97 CTV isolates from all over the world and cannot distinguish mild from severe strains.